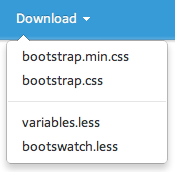 Assuming you know what Twitter Bootstrap, Font Awesome and Bootswatch are, here is how to integrate the happy trio. to Thomas Park, the author of Bootswatch, who helped to put the above steps together. This entry was posted on Friday, July 6th, 2012 at 12:34	and is filed under css, less, twitter-bootstrap. You can follow any comments to this entry through the RSS 2.0 feed. You can leave a comment, or trackback from your own site.